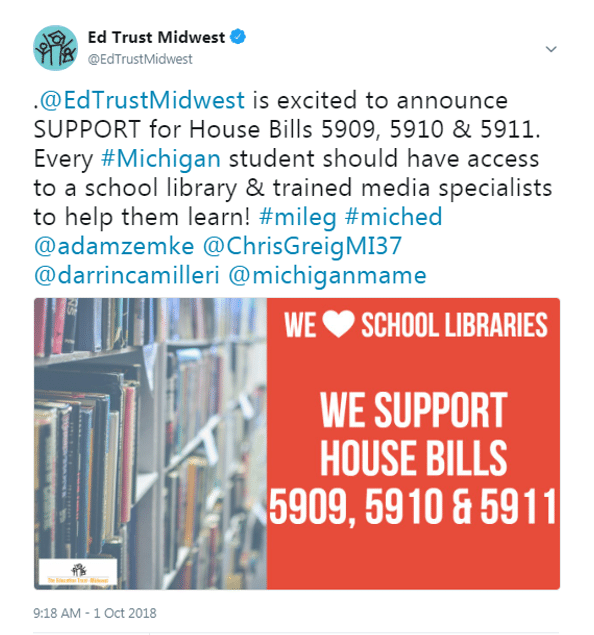 The Education Trust-Midwest is pleased to announce our support for three bills that will ensure that Michigan students have access to school libraries and certified media specialists. 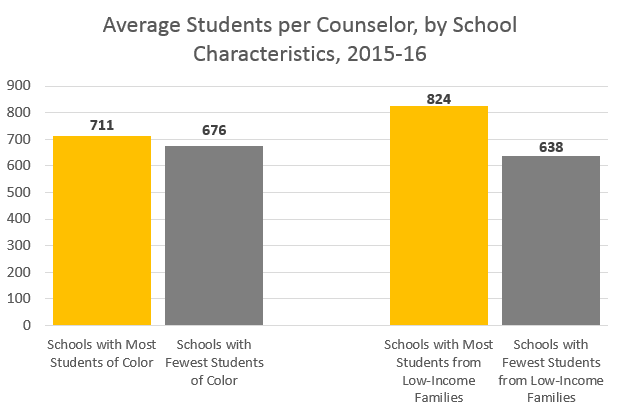 Maintain student access to school libraries with staff supervision, even when a certified media specialist is not available. The following guest commentary, by Brian Gutman and Lauren Hubbard, was published by Bridge Magazine on October 1. Read the full column here. Our nation’s history is revolutionary. It is rich in experiments that have reshaped global power, discoveries that have radically changed the way that we live, and raised up fundamental human rights well beyond our borders. But our history is also marked with a legacy of slavery, oppression of our own and fear-based decisions that deny basic rights to large swaths of Americans. This shared history – the good and the bad – have shaped our national identity. America’s full history is what Michigan students deserve to learn. 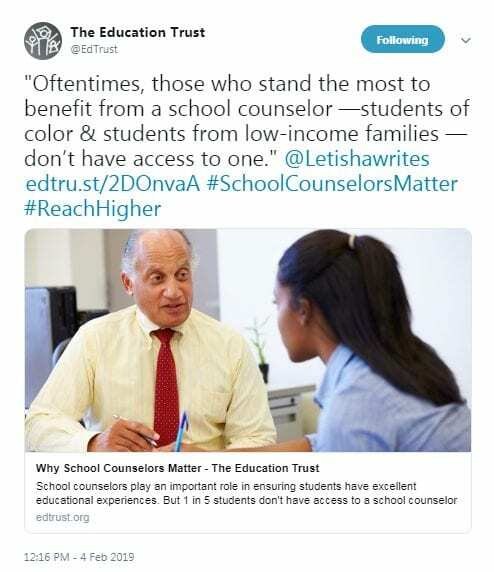 It is what we, as citizens, need our next generation of leaders to understand… This is why some of the most recent changes to Michigan’s social studies standards are so concerning. History has a troubling tendency to repeat itself. When we fail to teach the struggles and lessons of the past, we are bound to repeat the errors of our ways. Only by being forthcoming about both points of pride and stains on our national consciousness, can we build toward a more free, fair and equitable future. Get involved by applying to join the Social Studies Task Force by tomorrow, October 3. The Michigan Alliance for Special Education will host the Michigan Kids with IEPs Count Day Rally on Wednesday, October 3 from 12:30-2:30 p.m. on the steps of the Michigan Capital building. 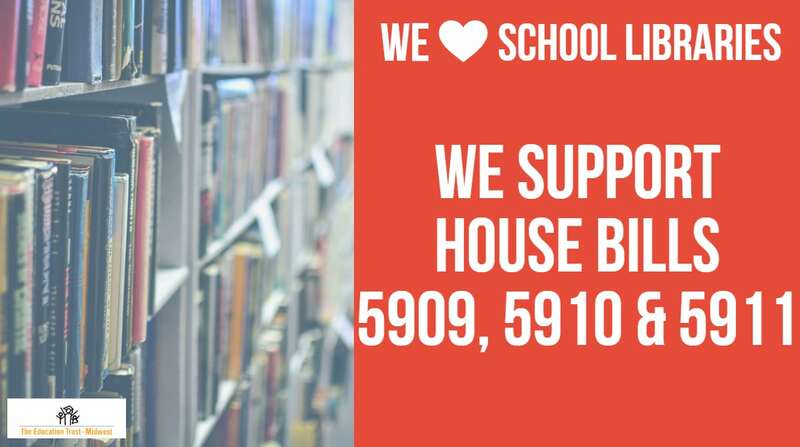 House Bill 5707 (Miller – R) and HB 6401 (Noble – R) which would significantly reduce the use of reliable and objective data in feedback to teachers and school administrators. 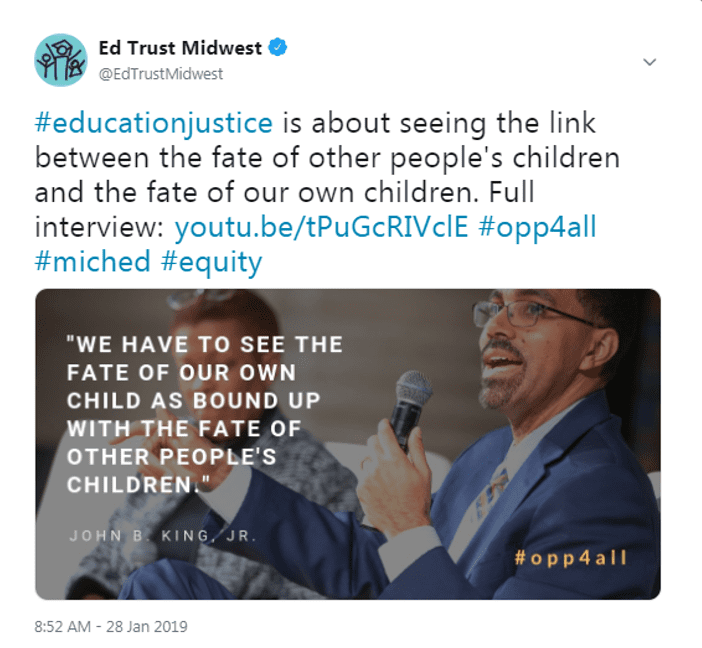 The Education Trust-Midwest opposes these bills. The State Board of Education will meet on Tuesday, October 9 at 9:30 a.m. at the Lenawee Intermediate School District TECH Center (1372 North Main St., Adrian, MI). The agenda is available here.